Alabama logging railroads once featured dozens of operations from small, one mile (or less) lines to those that featured nearly two dozen miles of track. Most of these railroads began operating around the turn of the century and lasted just a few years. However, some like the Alabama Central Railroad, operated for nearly six decades, accumulating quite a network of track and offering minor passenger service. Included below is information highlighting a number of Alabama logging railroads in a paragraph or two. However, this is not meant to be a complete, "all-time" listing of the state's logging lines, as the information on many is scarce at best (partly due to the fact that many operated just a few years and there was little ever written about them). What has been compiled are many of Alabama's most well-known logging lines and related operations. If you have or know of any additional information regarding Alabama logging railroads please let me know, as I would greatly appreciate the help. 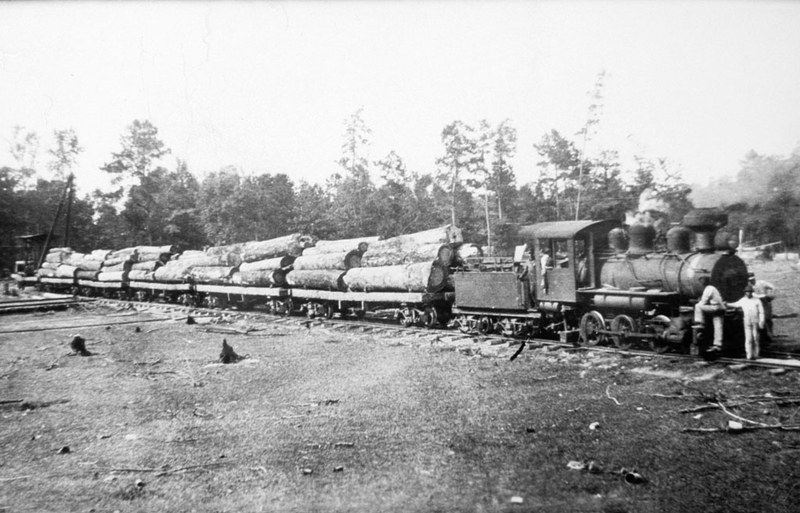 The Alabama & Mississippi Railroad was owned by the Vinegar Bend Lumber Company beginning operations in 1902, serving timber interests near Vinegar Bend, Alabama. The line eventually reached Leakesville, Mississippi and took over the Pascagoula, Moss Point & Northern Railroad in 1915. At its height the A&M operated roughly 76 miles of track using a fleet of seven steam locomotives (the largest of which were 4-6-0 Ten-wheelers). The Alabama & Tombigbee Railroad was operated by the Scotch Lumber Company to serve its sawmill at Fulton, Alabama. The railroad began operations in 1898 and at its peak operated about 22 miles, connecting with the Southern Railway at Fulton. It remained in use until a fire in 1930 destroyed the mill and the company switched to trucks upon rebuilding the structure. The Alabama Central Railroad dates back to 1906 as part of the Manchester Lumber Company. At its peak the railroad operated about 15.4 miles of track with Manchester the center of operations and branches running to Marigold, Sunlight to serve coal mines. The line also reached Jasper and a connection with with Southern Railway and St. Louis-San Francisco Railway. Logging operations ceased in 1926 although it continued on hauling coal until 1961 when the line was abandoned. The Alabama, Florida & Southern Railroad was owned by the E. L. Marbury Lumber Company and began operations in 1911. Overall the logging line featured just over 15 miles of track between Ardilla, Alabama to Malone, Florida. The AF&S operated independently for just six years before being purchased by W. S. Wilson and renamed the Alabama, Florida & Gulf Railroad. The AF&G subsequently abandoned all but just a few miles of the railroad. What became the Birmingham, Selma & Pensacola Railroad was originally constructed and owned by the Suttle & Weaver Land & Lumber Company in 1910 between Brent to Blue Girth, Alabama a distance of about eight miles to serve the area's timber interests. It later was stretched to Jericho and at its peak operated about 16 miles with a connection to the Mobile & Ohio Railroad. The BS&P had plans to build two additional branch lines, although this ultimately never took place. The railroad was abandoned by 1931. The Bolling Railroad was operated by the Milner, Caldwell & Flowers Company. It was a three-foot narrow-gauge operation serving timber interests near Bolling and featured about 11 miles of track. The line operated between 1880 until 1904 when operations were suspended. 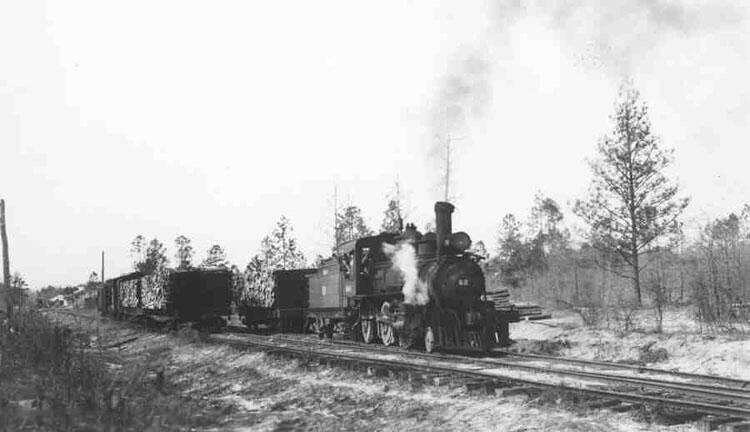 The Escambia Railroad was owned and operated by the Alger-Sullivan Lumber Company to serve its sawmill in Century, Florida in the northwestern part of the state. The line began operation around 1900 and remained in use through the 1950s before trucks replaced the railroad. At its peak the Escambia Railroad operated about 55 miles of track heading northward into southern Alabama and its rich timber holdings. The railroad interchanged its traffic with the Louisville & Nashville Railroad. The Manistee & Repton Railway was owned by the Manistee Mill Company based in Monroe, Alabama. The railroad began operations in 1907 and was one of the larger logging lines in the state operating some 45 miles of track. The M&R remained in use until the 1970s and a few miles of the railroad are still active under shortline Alabama Railroad. The Marbury & Kingston Railway was owned by the Marbury Lumber Company beginning operations around 1892 in Autauga County where they owned some 35,000 acres of timber reserves. It remained in use only until 1912 when operations were suspended. The Mobile & Gulf Railroad was owned by the W. P. Brown & Sons Lumber Company and operated a 10 mile railroad from Brownsville, Alabama to a connection with the GM&O. The M&G operated between 1914 and 1984 and still used steam until the very early 1970s. The Oak Grove & Georgetown Railroad was owned by M. L. Davis which operated a sawmill at Oak Grove, Alabama and used the railroad to haul logs. It began operations in 1904 and closed in 1927 when the sawmill ended production. The Perdido Pole Road was originally constructed by the Wallace, Sanford & Company which had built a sawmill near Wilson. It began operations in 1886 using a five-foot gauge line over a five-mile railroad. It remained in use through the early 20th century. The Seaboard Railroad of Alabama was owned by the Seaboard Manufacturing Company, which had constructed a sawmill at Fairford. The railroad began operations in 1890 as a three-foot narrow-gauge and eventually connected Nannahubba with Turners, Alabama in 1898, a distance of around 33 miles. The railroad itself fell into receivership in 1897 becoming the Tombigbee & Northern Railway in 1900 and again was renamed the Tombigbee Valley Railroad in 1904. It was switched to standard gauge that same year but suspended operations before 1905. 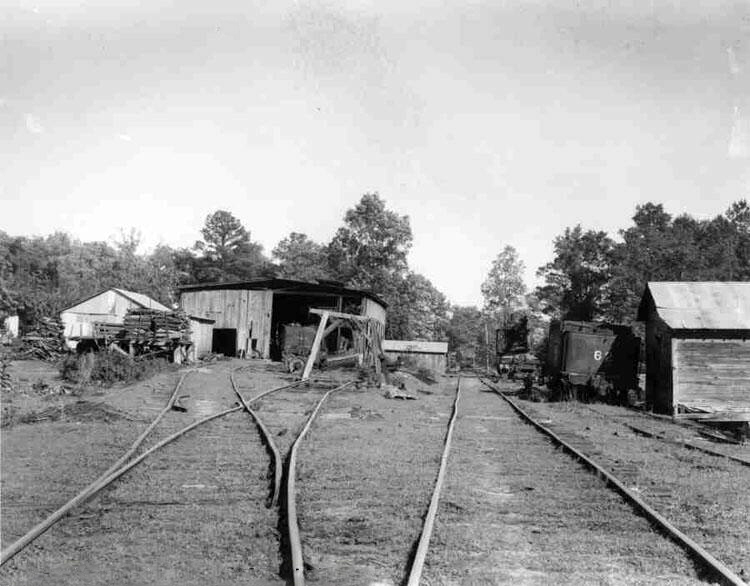 The Sumter & Choctaw Railroad was owned by the Allison Lumber Company beginning operations in 1901. It served a lumber mill near Bellamy and at its length operated nearly 30 miles of track reaching nearby timber holdings. The railroad remained in use all of the way through the mid-1980s. The Washington & Choctaw Railroad was originally owned by the E. W. Gates Lumber Company. It began operations in 1901 and eventually connected Yellow Pine (where a sawmill was located) with Bolinger, Alabama tapping the area's timber reserves. The railroad changed hands a number of times before discontinuing operations by 1927. Finally, for additional reading about the state's once prolific logging operations please click here. This page lists each individual company, their location, the years in which they operated, and more.